(if you have amazon prime) wonderful allergy friendly cookies show up to your door step! I love the concept behind the amazon button. I know I'm prone to forgetting things. Its an easy way to order your favorite items without rushing to your computer. With one little press you can have 6 boxes of Soft Baked Snickerdoodles sent to your door! Enjoy Life has so many products on amazon prime that you don't have to buy in bulk for every item. And if you forget to order it! Thats what the amazon dash button is for! 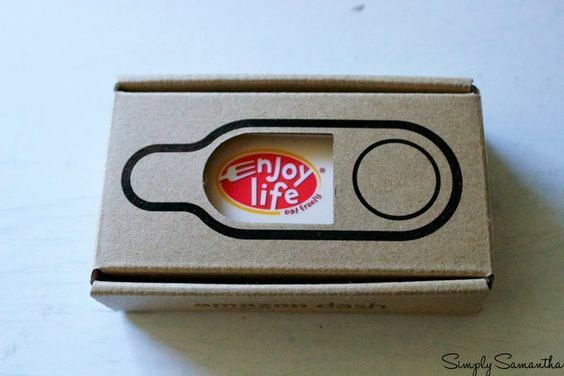 The Enjoy Life Amazon Dash Button is available to order now and will be stocked and read to go on August 9th. After your first press, amazon will reimburse you the price of the button so its basically free if you use it! Woot Woot! This post contains affiliate links! And I was sent this product by Enjoy Life Food in exchange for a review. Opinions are 100% my own. Yeh! Now I know where I can go when I'm having some cookie cravings. LOL. Aww! How sweet of you to leave a comment! I love reading them and replying to them. If you are new make sure to leave a link to your blog so I can come visit and say hi! Welcome to my little place on the internet! You've probably already guessed by the title of my blog, my name is Samantha and I like to live my life very simply. Thank you for stopping by and reading about my simple life.